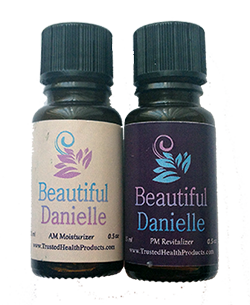 I was fortunate to be sent a bottle of both the Beautiful A.M. Moisturizer and the P.M. Revitalizer from Trusted Health Products. I am always curious when it comes to new skin care products and was happy to try it out. Your skin recognizes Beautiful as food and therefore will be hungry for it and may require more drops initially. Place 2 to 3 drops on each cheek 1-2 times daily and gently spread over the entire face with your middle finger in a circular motion. Do not rub in. If there is any excess after 3 minutes, blot your face with a tissue or damp cloth. There shouldn’t be any excess, so if this happens you may be using too much product. When used as a makeup remover, place 1-2 drops on a Q-tip or cloth and wipe away makeup. Trust Health Products states that within the first 30 days of using Beautiful, you may experience a brief blemish breakout. This typically can last from 1-2 days, possibly up to a week. The botanical oils in Beautiful gently and naturally remove all the toxins and buildup that have accumulated over time from the use of chemical-laden skincare products and cosmetics. The ingredients in Beautiful also help remove the cause behind excessive oil production. If a breakout occurs then it is a good sign that you skin is ridding itself of all the toxins that have built up over time. Most people experience noticeable changes within a few days, but even greater benefits are achieved in the first 3 months. Each bottle sells for $24.97 or you can buy the set for $44.94. My first impression of beautiful was how cute the bottles looked. They were both personalized to me with my name on the bottle. 🙂 I was really excited about this! When I opened the bottles I instantly noticed that they smelled so fresh and herbal. I could really smell the orange that is in the product, which I absolutely love. I was a little concerned about using an oil on my skin as I have very sensitive skin and a many products tend to break me out. In case you don’t know, I have combination skin and often times become oily in the t-zone if I use the wrong products. The product is intended to be used as an all in one product to remove your makeup and act as your moisturizer and everything else. I still remove my makeup with my regular facial cleanser and use Beautiful as more of a moisturizer. I have been using the A.M. Moisturizer every morning after my shower and the P.M. Revitalizer every evening before I go to bed. At first I needed to use more of the product, but now only need a few drops and my skin soaks it all up in a matter of seconds. I have been using this product for about two weeks now and have not broken out. The two 0.5 ounce bottles are pretty much still full as you use such a small amount of the oil during application. The season of fall is here, and that is when skin tends to start drying out and looking dull. I have noticed that my skin still looks vibrant since I started using Beautiful. My summer tan is gone, but my skin is still glowing thanks to this product. I haven’t noticed if it has helped smooth any of my fine lines and I think that is something I will see improve over time as it has only been two weeks. Trusted Health Products also has a skin care system for Men, called You’re the Man. I haven’t tried this one out obviously, but if it is as great as the women’s line then I’d recommend it. 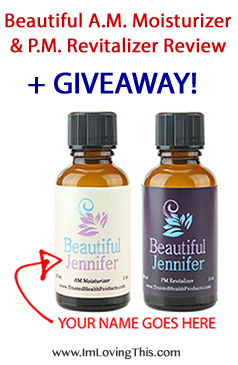 Trusted Health Products has agreed to give away one bottle of Beautiful A.M. Moisturizer to three winners! The giveaway will run through December 10th, 2013. It is only open to the U.S. and Canada. Enter by using the widget below. ** I received no form of monetary compensation for this post and there were not affiliate links used. ImLovingThis.com is not responsible for the delivery of this prize and cannot be held accountable if for any reason that it is not received. I really love Eclos face wash.
I’ve always liked the Clinique line of skin care. I don’t have a favourite…that is why I am always willing to try new products~!! My favorite skin care line in the Clique 3 Step System.